Somewhere in the Pacific Ocean…3 sea days down and 1 more to go and we will be arriving in Hawaii! Being out in the middle of the ocean really cuts you off from the world, the tv reception works sporadically and the Internet is snail slow at best. 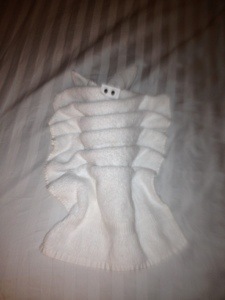 I have had some unusual company…the zoo animals that appear every night on my bed! 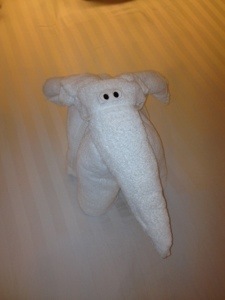 After 21 days, I will literally have a jungle full of towel animals…but they put a smile on my face every night! 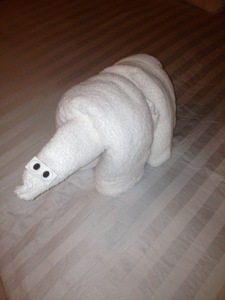 « Older Post Out to Sea! » Newer Post My First Taste of Hawaii!